I met a local professional landscape photographer on flickr several months ago. He noticed that I was into hiking so we decided to meet up for a hike. His friend Hans suggested we go to Corte Madera, past Pine Valley. I had never been there before so I was interested in being on a new trail. Throughout the week I had checked the weather reports and I saw a 50% chance of rain/snow for the area. On Saturday evening we confirmed that we would go anyway. I met Alex, his wife, their dog, and Hans at a shopping center in North County on Sunday morning at 10 and from there we drove to the trailhead, which took us about 90 minutes. I normally don’t leave home that late in the morning, but they told me that since it was a short hike, 6-7 miles, we didn’t need to start so early. Plus, we would begin hiking in warmer conditions. There were heavy clouds in the sky, but it hadn’t started raining yet. We got to the trailhead a little before noon after trying to find Corral Canyon Road referenced in Jerry Schad’s book. I recommend driving a car in which you feel comfortable taking it on a dirt road for about 2 miles. Alex was not happy with that bit. After loading up camera gear and getting Toni, the dog, ready we started on the Espinosa Trail. It’s a rather secluded trail in an area which I’m not too fond of, but since Hans had been here before I didn’t feel so uncomfortable. We started under oak woodlands passing sycamores with beautiful golden leaves. The ground was still damp from the light rain we had overnight. 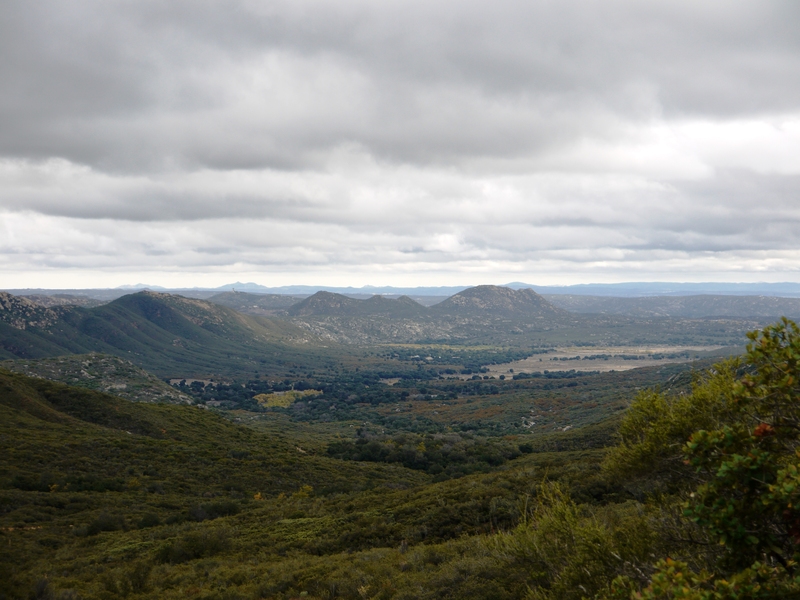 As we ascended up the trail we arrived to the saddle where you can turn around and see the Lake Morena area below. 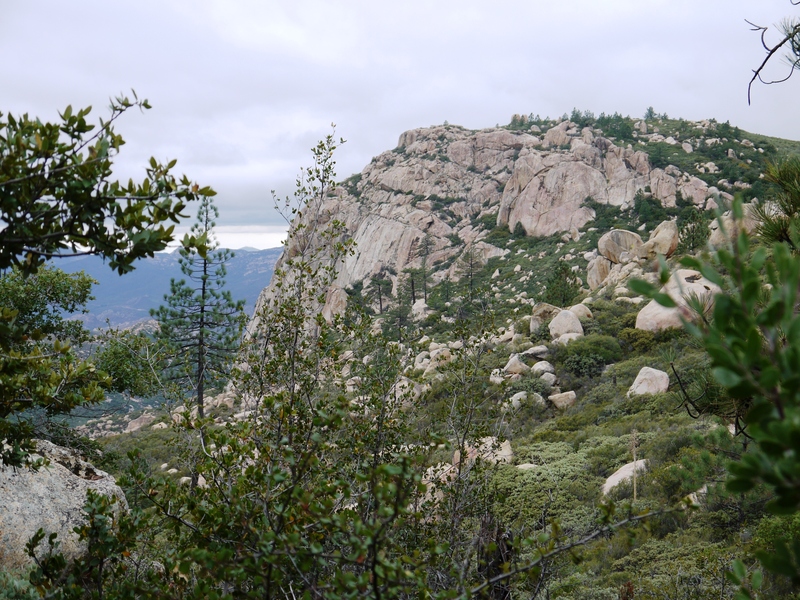 We veered right at the saddle and continued into an area beautifully dotted with boulders, chaparral, Manzanita, and Coulter pines. I’m glad Hans was with us as I probably wouldn’t have managed to reach Corte Madera Mountain on my own. Alex and his wife were behind Hans and me. At one point Hans wanted to make sure that they took the right path so he turned back to see where they were. When he got back to me he told me that Alex’s wife decided not to continue because of pain in her foot. 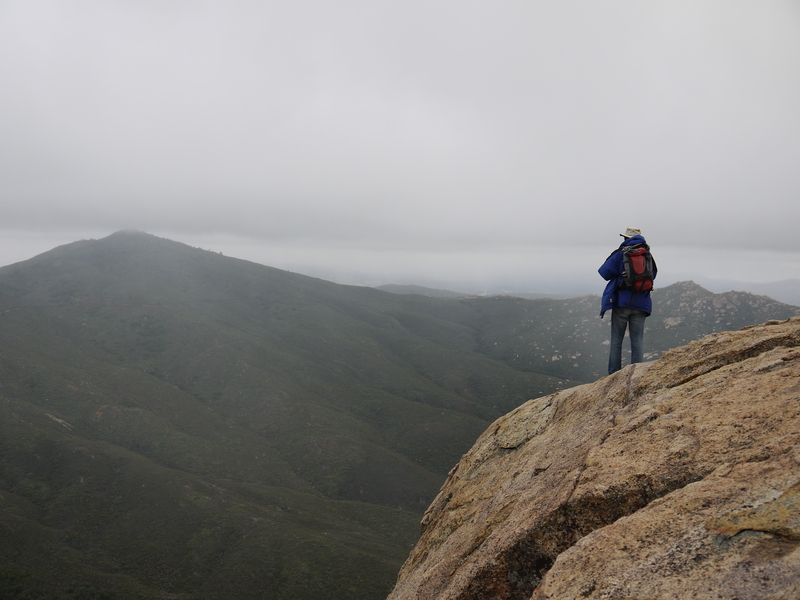 So Hans and I continued to the summit plateau of Corte Madera Mountain as quickly as possible to beat the ominous rain clouds. It was windy and misty when we finally reached the summit. I warmed up with hot chocolate while Hans took pictures of the dramatic scenery. Eventually Alex and Toni caught up with us. Alex got what he wanted that day; wet clouds and fog, or what I thought to be Scottish weather. (No, I’ve never been to Scotland). Despite the clouds, the views were spectacular. One can see Los Pinos Mountain, Espinosa Canyon, and I’ve heard that on clear days one can see into Baja California and the Santa Catalina islands. We quickly ate our lunch and then headed back down careful not to slip on the damp rocks. Every now and then I would turn around to find Alex changing the lenses on his camera. I enjoyed the hike very much for the varied terrain; the pine trees, the sycamores, the granite rocks, and the dramatic views. I’ll have to come next time on a clear day. We made it back to the car a little after 4pm. My GPS calculated 7.28 miles with an elevation gain of 1,829 ft. It was a great hike and I see myself going back there again. A long time hiking buddy of mine (my mom) turned 60 in October. To celebrate, my sister and I took her to June Lake, CA for a 4-day weekend of hiking and enjoying the eastern Sierras. I had never been to June Lake before. Let me tell you, that place is beautiful. It’s past Mammoth, a popular winter destination for skiers and snowboarders. We didn’t get to stop into Mammoth, but people tell me June Lake is less developed. We arrived on a Thursday evening at the Haven, a quaint cottage near June Lake. 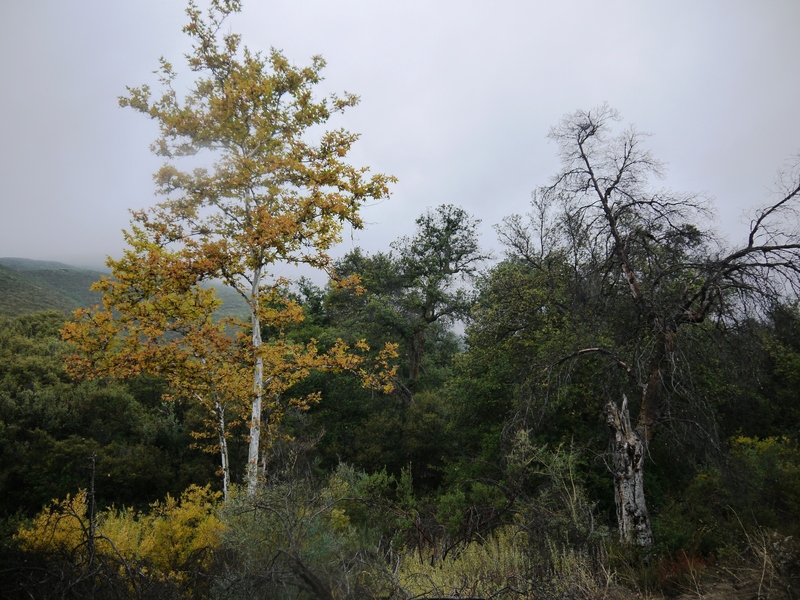 On Friday we did our first hike, the Rush Creek Trail. The trailhead is near the Silver Lake Resort. We started out around 10am under clear skies. The temperature was perfect! Warm, according to the locals but still a bit chilly for my southern California bones that I had to wear a few layers. But the trail is a steep ascent and one warms up fairly quick! As you ascend and approach a waterfall, you get views of Silver Lake. We stopped near the waterfall to soak in the air. Continuing on, we reached Lake Agnew. 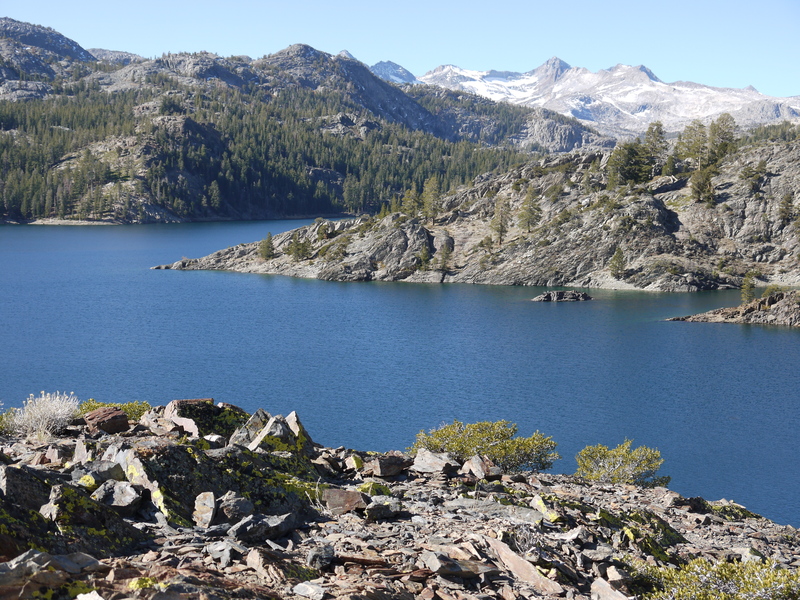 The lakes we passed on this trail are damned lakes in the Ansel Adams Wilderness. After Lake Agnew, you reach Gem Lake. Oh, it was gorgeous! Coming up over the pass and seeing the lake with snow-covered mountains behind it was amazing. And we had the entire trail to ourselves! We took several pictures, had a snack and then continued on to our final destination,Waugh Lake. My sister was way ahead of me and my mom was about 15 minutes behind me, so I was pretty much on my own. It was nice hiking among the pine trees and taking pictures of small ponds and rocky creeks. We reached Waugh Lake around 2pm. One can continue on that trail, but my sister recommended that we head back around 2:30pm if we wanted to make it back before dark. We agreed, and after taking several pictures at Waugh Lake, we headed back to the trailhead. Nothing much exciting happened on the way back down. If you’re ever in the June Lake area, then I highly recommend the Rush Creek Trail. We covered 14.5 miles with an elevation gain of 3,431 ft.